These are sometimes referred to as Overnight Cookies, as they bake throughout the course of the night (you forget them in the oven). They are to baked goods what the crock pot is to chili. I tasted my first Forgotten Cookie this past Sunday, where else, but at church. A long time member and church book shop assistant brought the snacks to a group study. I really adore her and her husband. They met in Kindergarten and the husband worked on his Eagle Scout senior project sometime in the 40’s, if that helps with the math. I could tell the cookies were a type of meringue and was a bit confused at the first bite. By the third bite, I was melting! 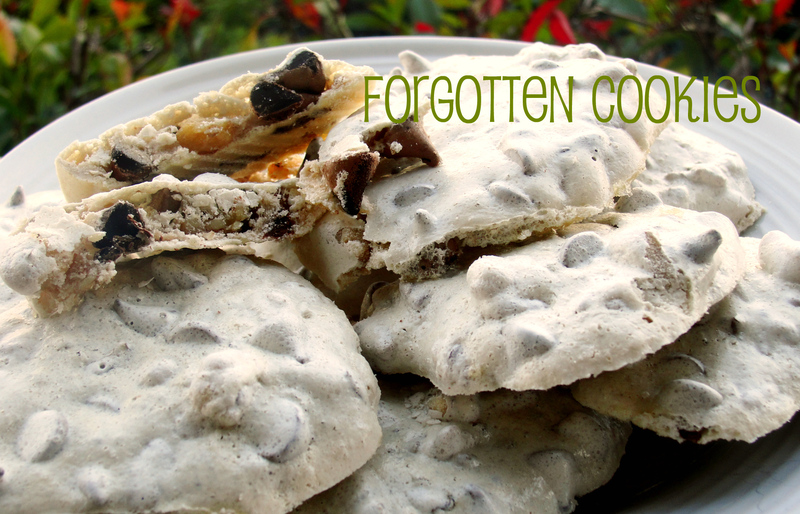 These light meringues have nuts and chocolate chunks hidden inside and are of course…addicting! Ack! The baker told me just how easy these guys are to make and recited the recipe across the table. These light cookies are flourless and would be a fun treat to bring out in the middle of a long trip. I always want to bake the night before we go somewhere, but there is never enough time. The next trip we head out on, I plan to start these the night before, as well as a large crock pot of overnight oatmeal. Who says you have to have cold cereal or a $3 Starbucks scone the morning you start your vacation? As with all meringues, the egg whites need to be beaten until stiff. Both boys were asleep, so I couldn’t turn on my blender last night. To make matters more complicated, Mr. Movie Fuel had been watching Rise of the Planet of the Apes all night. I don’t care if they are going to turn evil, I felt so sad for those caged monkeys. It was a creepy movie and I chose to hide out in my bedroom, while trying to quietly whisk egg whites. If you haven’t tried that before, let me offer you this suggestion, don’t. All I could think of, while whisking away in my bedroom, was the poor Amish women. Sure, they are happy as long-haired, makeup-less, peaceful clams, but they must have a lot of cooking induced injuries. I wonder about their forearms, are they bigger than the rest of ours? With all the hand whisking and dough rolling, those chicks could probably arm wrestle Hulk Hogan without breaking a sweat. In hindsight, I should have kept whisking until I popped a socket. Next batch, I’ll remind myself to “Think Amish!” The cookies turned out more flat than they were supposed to. I crowded one pan instead of using two, which didn’t help in cookie shaping, either. Regardless, they tasted fantastico!